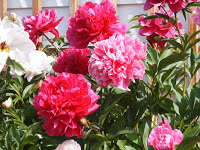 The peonies this year have been outstanding in their display of numerous and large flowers. I am not only enjoying them visually but also enjoying their fragrance. I remember the scent of peonies that were in my grandmother’s backyard in Illinois. I was barely more than a toddler then.